Witches Night Out by With Thy Needle & Thread - 40 ct. Legacy Linen by Picture this Plus using the called for cotton hand-dyed threads (1 over 2). One for the Crow by With Thy Needle & Thread - 40 ct. Legacy Linen by Picture this Plus using the called for cotton hand-dyed threads (1 over 2). Oct. 31st by With thy Needle & Thread - 40 ct. Legacy Linen by Picture this Plus using the called for cotton hand-dyed threads (1 over 2). His Eye is on the Sparrow by Heartstring Samplery - 36 ct. Doubloon by Picture this Plus using the called for hand-dyed cotton threads (1 over 2). 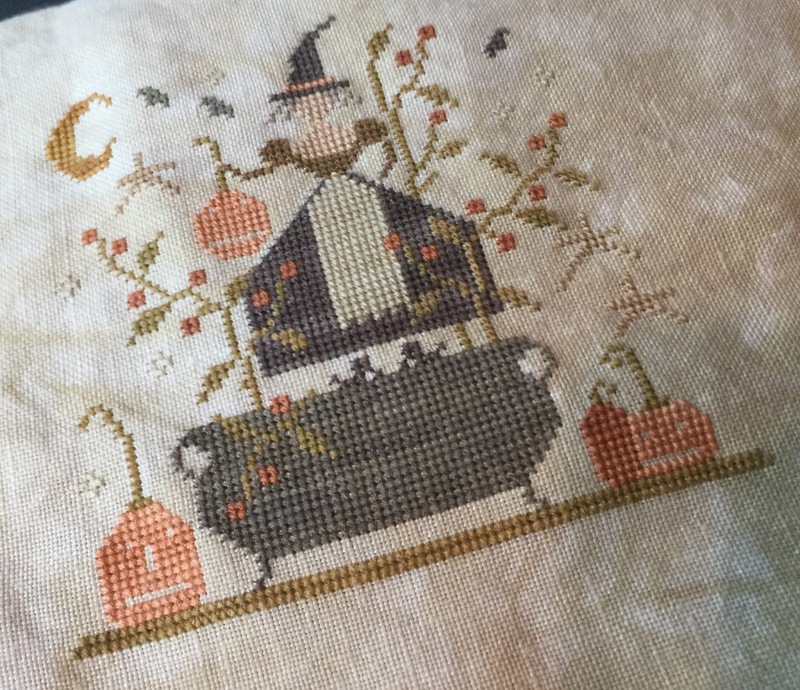 Lantern Lane by Little House Needleworks - 40 ct. Fawn by Lakeside Linens using Belle Soie silk threads (1 over 2). Dorothy Walpole by The Scarlet Letter - 40 ct. Vintage Pecan Butter by Lakeside Linens using the called for silk threads (1 over 2). 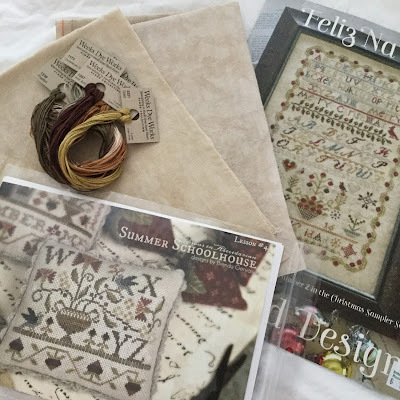 From The Stitch and Frame Shop in Rock Hill, SC - Feliz Navidad by Blackbird Designs, Summer Schoolhouse - Lesson 4 by With Thy Needle & Thread, 40 ct. Sand by Picture this Plus, 40 ct. Legacy by Picture this Plus and Weeks Dye Works threads. From Summer House Stitche Workes - Fragments (1st series), Simple Abundance, Pyns pillow kit and 36 ct. Cocoa linen by Weeks Dye Works.